In May, 2008 we went to Chanute, Kansas, to do a factory tour of the NuWa Hitchhiker 5th wheel manufacturing plant. 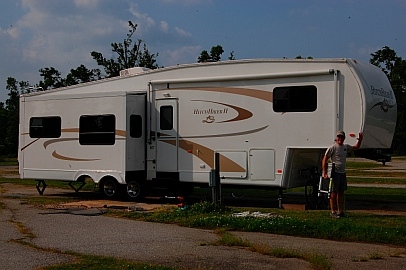 We were so impressed that we bought a new fifth wheel trailer right then and there. 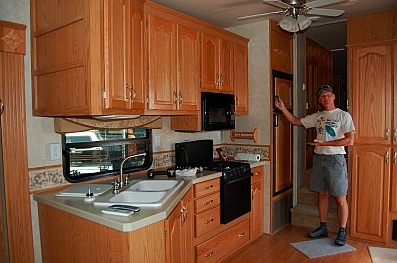 This 2007 NuWa Hitchhiker II LS 34.5 RLTG fifth wheel trailer was the third RV we had owned and was our second full-time RV home. Ever since that time, other than a nearly four year cruise of Mexico on our sailboat from 2010-2013, during which time we alternated between cruising and RVing, this fifth wheel trailer has been our only home. 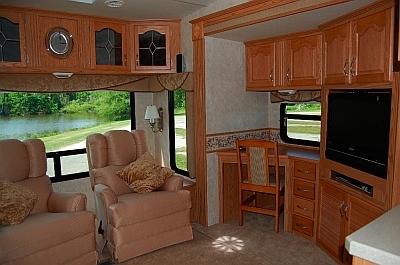 It is a 36′ long fifth wheel with an open floorplan that includes three slides and offers 360 square feet of living space. It was designed and built with full-timing in mind, so it is more rugged and better insulated than almost any other brand on the market. The floorplan is open and spacious. 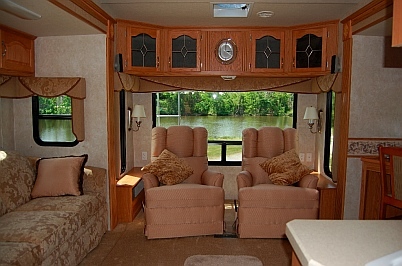 For us, the two recliners and the desk were the major reasons for our move from our smaller travel trailer into this bigger fifth wheel, as those features make life infinitely more comfortable. We swapped the position of the sofa and recliners, and put one of the four chairs at the desk and the other in storage so there are just two chairs at the dinette table. Before we bought this 5th wheel trailer in 2008, we already owned a 2007 Dodge RAM 3500 long bed single rear wheel truck which we had purchased brand new the summer before. It works a lot harder pulling this trailer than it did the Lynx travel trailer, which was our previous full-time RV, however we could still get up and down the big mountains out pretty well..
We used to get 8.5-10.5 mpg while towing, but since we installed an Edge Tuner on our diesel engine in October 2014, we now get 10.5 to 13 mph while towing. Vent-Free Propane Heater – A vital component in the winter if you like to boondock. Edge Tuner – Gives us programming control over our truck engine for better mileage / performance without “chipping” the engine. The dining room table and chairs and the sofa are in the big slide-out on the curb side. 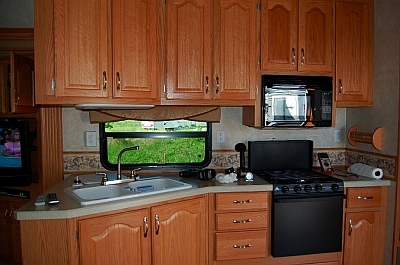 We love the big picture windows along the side and back of the trailer – they let in light and give us views! 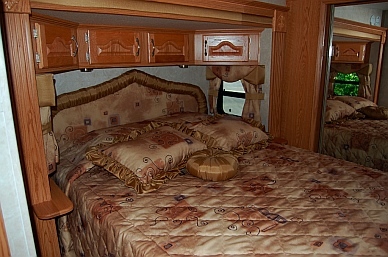 Most modern trailers have short (60″ or 66″) sofas. This one has a 74″ sofa, long enough for Mark to stretch out on. The recliners are very relaxing. We found we weren’t as comfy without them in our old trailer. The kitchen is open and easy to work in. A big window and expansive counter tops. The desk was a nice addition and gets the mess off the kitchen table! 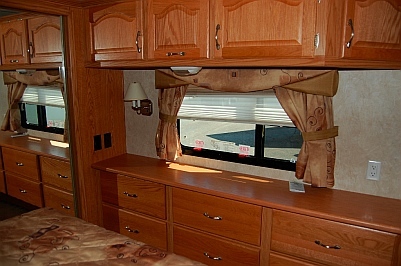 The queen bed has a window for each occupant — a nice feature if you want a light breeze on you at night. The dresser and wide closet allow enough space for all our clothes for all seasons. 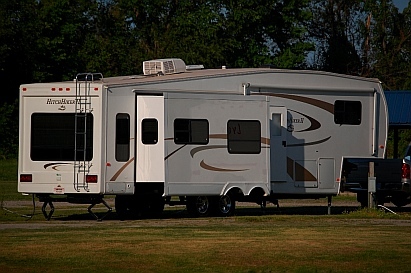 Unfortunately, the economic downturn in 2008 shook up the RV industry right to its core, and many excellent manufacturers of full-time quality RVs went out of business. NuWa ceased building fifth wheel trailers in 2014. 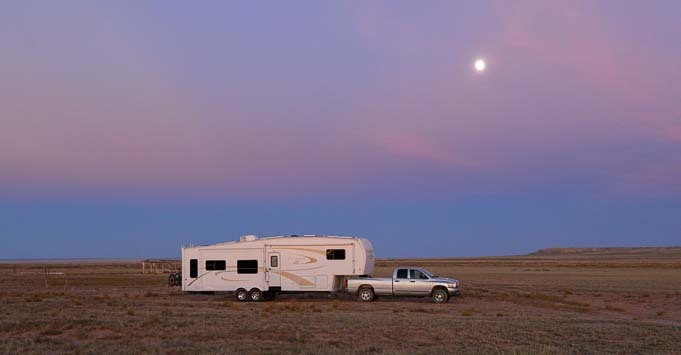 Their outstanding RV service center in Chanute, Kansas, is still in operation, however. Their manufacturing plant has been replaced with an RV dealership called Kansas RV Center. This entry was posted in Boats & Rigs and tagged Non-Travel, Popular Articles, Truck Trailer Hitch by Roads Less Traveled. Bookmark the permalink. 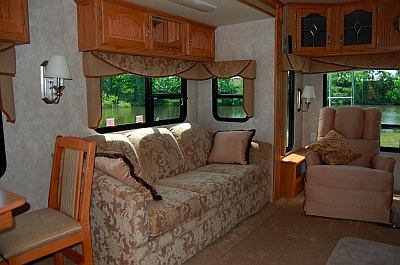 Have you looked at the Fifth wheel campers with the living room up front? Would this be something you would want? We’ve seen several. It’s cool. You get a great view of the surroundings from high up. We haven’t considered it for ourselves because we like an open floorplan that puts the living/dining/kitchen areas in one place. The bigger area and taller headroom in a big fiver is the downstairs area. So we prefer to have all of those things down there and to keep the lower headroom area for the bedroom where we are usually horizontal. How do you carry you bicycles on the back of your rig? We use a Kuat NV Bike Rack. Detailed blog post here.